Last week the 52m replica sailing yacht K1 Britannia was lifted from her cradle at Venture Quays in Cowes, UK, and moved to Hythe to be finished. The original Britannia was designed by George Lennox Watson and built by Henderson’s on the River Clyde in 1893 for Queen Victoria's son Prince Albert. On the death of his son, George V in 1936, she was scuttled, in accordance with his last wishes. In 1994 an exact replica of Britannia was commissioned by a Norwegian businessman and her hull built in Russia before being sent to Norway, but unfortunately completion of the project came to a halt. Finally, she was renamed K1 Britannia and, towed from Norway, she arrived at Cowes in the Isle of Wight on 4 February, 2012 where she was lifted and dry-docked at Venture Quays. There followed many months of painstaking work to install a new interior and decks. She will eventually be fitted with the tallest wooden mast in the world at 55m. 'We're aiming for completion of K1 Britannia at the latest in June 2015,' says Scott Ward, director of K1 Britannia, the trust behind the rebuild. 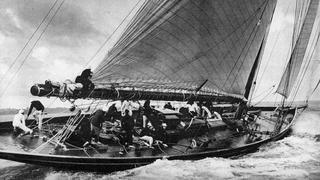 Funded through the Kickstarter website (a crowd-funding platform for creative projects) sailing enthusiasts, philanthropists and heritage organisations have contributed to the initiative to construct K1 Britannia. She will become a floating venue offered to charities around the world for fundraising activities.